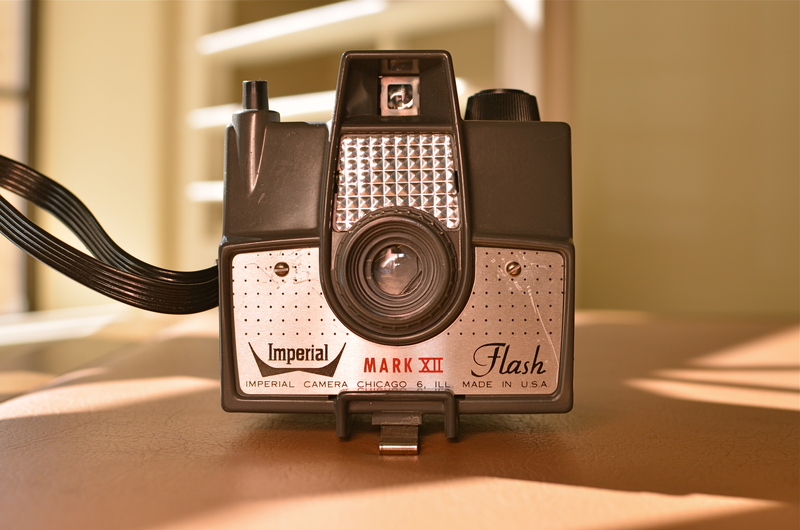 Let There Be (A Way To Catch) Light: The Imperial Mark XII, my first camera. 1/200 sec., f/5.6, ISO 125, 35mm. TIME, AT MY LOCATION IN LIFE, NOW PROCEEDS LIKE A CRUISE MISSILE, OR FASTER. Some days the signposts are zipping by so quickly that I seem to be inside a blender going full tilt puree. I began THE NORMAL EYE as a kind of “let’s see what happens” project in 2012. Back at the starting line, 200 posts ago today, I wondered if I could even get to 200 words. Then a lucky accident occurred. Photography, which, over a lifetime has been an unfailing miracle of discovery for me, willed that passion onto my pages. Maybe it’s the kind of writing that is available to me, to all of us, as a unique feature of the present world. Maybe I had to live this long to become a chronicler for my eye and the soul that stands behind it. As a broadcaster, I made my living for over thirty years writing advertising copy, news features, presentations, columns and tutorial material, but always for someone else, always to other agendas beyond my own. But, even while I was working for everyone else but myself, photography served as one of the very few constants in my life, and one of its principal sources of joy. Happy problem: I feel like I need another whole life to try to realize what I can now visualize. If I have any regret, it is that I learn everything the hard way, the slow way, experientially. If I could conceptualize the finer points of the art of imaging without running it personally through my own fingers, I would. It would save time, a premium item at any age, but beyond price from where I stand now. When I first began clicking away as a kid with a kamera, I knew nothing but that I wanted to make pictures. I was divinely unaware of how truly ignorant I was and keen for the fray. My father, being a graphic artist, subscribed to Life magazine when it was still the premier photo newsmagazine in the world, tearing out the images in every issue and organizing them into a morgue file. There was the world in our garage, alphabetized as a ready reference on any subject. Want to know how to draw a giraffe? Look in the G folder. But something else was happening as well. I was getting a crash course from the leading photographers on the planet as to how to see, how to show what you saw, how to make others see. I had my own version of the twelve apostles in the works of Alfred Eisenstadt, Gordon Parks, Larry Burrows, Richard Avedon, Otto Karsh, Margaret Bourke-White, and a half dozen others. Inside this special Bible I studied chapters and verses from the books of Aperture, F-stop, Exposure, Tri-Pan X, Graphlex. Praise the Lord and pass the polarizing filter. As photographers, we all know that our favorite picture is the one we haven’t taken yet, since therein lies the potential for everything. I have to approach this blog the same way. Your input and my impatience have both fueled the fun and the fury of THE NORMAL EYE, and I hope to continue the affair as far as it will take us. I can’t focus for infinity, since I don’t know how far away that is. But, with your help, I can definitely manage 200 words at a time. This entry was posted on March 6, 2014 by Michael Perkins. It was filed under 35mm, cameras, Composition, Nostalgia, Viewpoint and was tagged with Auto-biography, Blogger, Composition, Journal.